Boysenberry - The Boysen originated in California and was introduced in 1923. Very large, non-shiny, dark maroon berries. Soft, very juicy flesh. Distinctive, rich, tangy flavor and very aromatic. Excellent for eating fresh, juice, freezing, canning, pastries, and preserves. Ripens around July 1st, and are among the largest of the small fruits. Vigorous, trailing vines. Boysenberries are hardy to approximately -10 F.
Boysenberry, Thornless - Developed in California. Very large, almost seedless, sweet, juicy, full-bodied flavor. Good for fresh eating, freezing, jams, preserves, pastries, juice, syrup, and wine. Very low chill. Too soft for shipping. Ripens during May and June. 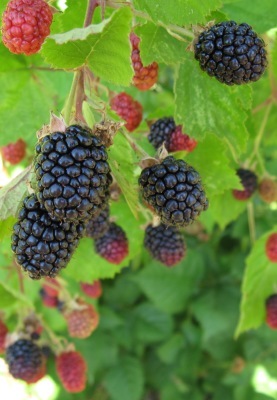 Thornless forms of all blackberries should not be cultivated deeply as damaged feeder roots will send up an occasional sticky sucker that has to be removed. Requires winter protection below 0 F (image)​. 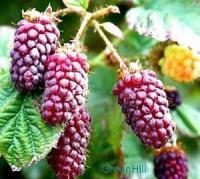 Loganberry, Thornless - Originating in California, the Logan is thought to be a natural cross between a California native blackberry and a red raspberry. The berries are long, large, dark red, acid, and highly flavored. The Logan is often used for pies, juice, and wine. Not as widely grown commercially as it once was. There is a high demand for it in the home garden due to its desirable flavor. Thornless canes; average yields. Hardiness is similar to Boysen (image)​. Marion - Originated in Oregon as a cross between the Chehalem and Olallie Blackberries. It's berries are large, bright black, and excellent flavor. Recommended for fresh eating, jams, preserves, and desserts. Vigorous, thorny plant, strong canes and thrifty cane production. Ripens in July and early August along with the Boysenberry. Seeds are 1/7 the size of Boysen. Marion is popular commercially and is possibly hardier than Boysen (image)​. Olallie - Developed in Oregon, but produces extremely well in California where the lack of day length and cold limit the productivity of some Blackberries. Large, shiny, firm black berries. Sweet with some wild blackberry flavor. Vigorous and productive trailing thorny canes. Ripens in July. Good for fresh eating, jam, and freezing. Tayberry - Introduced by the Scottish Horticultural Research Institute. Named after the River Tay in Scotland. 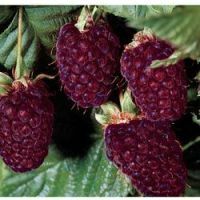 Tayberry was bred from a cross between the Blackberry Aurora, a high quality variety bred in Oregon, USA and an improved Tetraploid Raspberry from the breeding program at the Scottish Crop Research Institute. Tayberrry is ready for picking from early July through mid-August. Long, moderately vigorous canes. Berries are large, long conical shape and a reddish-purple color with excellent, slightly aromatic flavor. Excellent quality for freezing, canning, jams, and jellies. Tayberry has shown considerable promise for the fresh fruit and processing markets (image)​. ​​Youngberry - The Young is very similar to the Boysen except it ripens earlier and the berries are milder and less acidic than the Boysen. Fruit size is the same as Boysen but a little firmer and shiny. Excellent flavor, good for fresh eating, freezing, canning, and juice. The Youngberry rivals the Boysen in fruit production and its vines are vigorous and hardy, making it excellent for the home gardener.